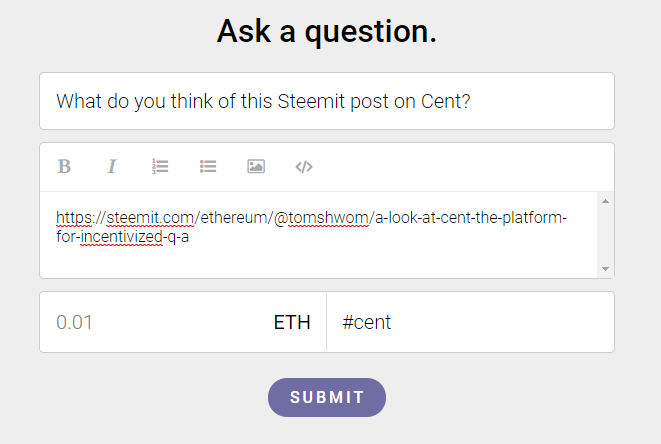 We Steemians are no stranger to the idea of being paid for creating and curating good content, but Cent aims to turn things upside down by letting users place bounties on their posts, and the commenters then vote on who will get a piece of the bounty. Unlike Steemit, users know exactly how much potential payout there will be for spending time on a good comment. This is very interesting because users can choose to not spend so much time and energy if the maximum payout is $0.30. Theoretically, responses should scale according to the bounty, in both quality and quantity. It's also very interesting that other commenters are the ones who determine who gets part of the payout. This eliminates the self-upvote issue, since you can only vote on other people's comments. It also eliminates spam on the platform, since there's no payout for submitting a question and only quality comments will attract other user's votes. 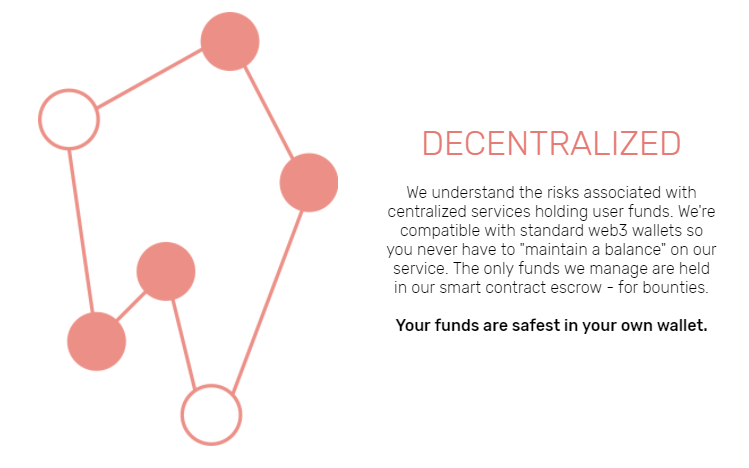 Cent handles the bounties and payouts using the Ethereum network and smart contracts to ensure the platform is trustless, decentralized, and easy for Ethereum users to jump right in. Account creation simply requires an email, password, handle, and payout address. If the platform was fully decentralized, then it could link up with MetaMask or some other DApp explorer, but this would make it unnecessarily slow to load questions/responses. If you want to stay anonymous, just use a unique password and a throwaway email - there's nothing to keep you from creating another account with the same payout address, and no reputation system that makes your account worth anything the more you use it (yet). One thing I really like about Cent is that it's not unnecessarily tokenized. 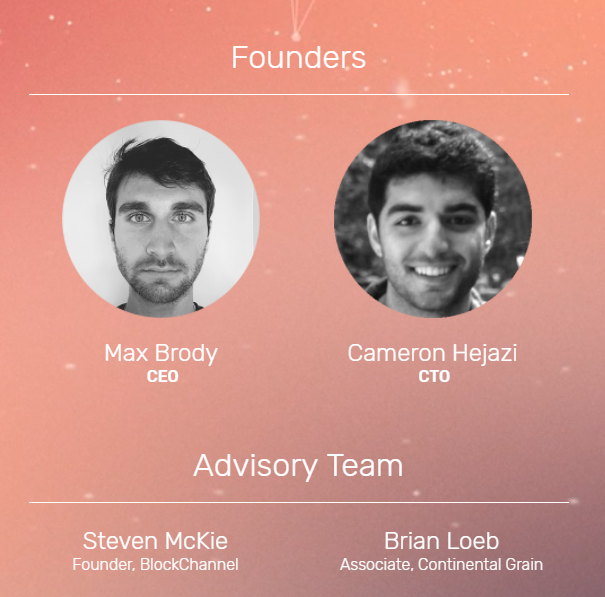 No ICO, not even a kickstarter. A small team for a small and simple project, just as it should be. Actually using the Cent beta is very straightforward. Simply put your question in, how much you want to pay for answers, and wait 24 hours to collect responses! One thing I'm concerned about is the potential for somebody to create multiple accounts and direct payouts to themselves with the voting power. At the moment, there are only a couple dozen responses on many questions, so it would not take a lot of accounts to attack this platform and steal all or a large majority of the payouts with spam comments and votes to yourself. Another issue is with features. You can't set your question to accept answer for longer or shorter than 24 hours. If you're not one of the first to make a comment, other users probably won't even see your comment and it won't receive any votes. Also, ETH is the only payout option, but there are plans to include more Ethereum-based tokens soon. A major issue I have with the platform is the inability to comment on other user's comments. It would be much better if the questions worked more like Reddit threads, and every comment had an up/downvote option. I see many responses win the majority share of the bounty that have sub-par information, or even false statements! If you want the platform to be Q&A, then discussion is still important. Leave a like or resteem if you enjoyed this content. You can also support me directly by sending ETH or ERC20 tokens to Tomshwom.eth. Leave your thoughts below about Cent, will you be signing up? Very cool--this is the first I've heard of it. I'll have to learn more. Thanks for being insightful.